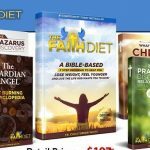 Don’t waste your time trying The Faith Diet by ‘Father White’ for your weight loss because it is a scam! This ‘Bible-based’ program is nothing but a lazy attempt to rebrand 60 Day Fix, a scam I exposed in this blog in January last year. Apparently after I exposed it as fake, the scammer abandoned the 60-Day Fix name and even changed the author’s name in order to make it look original or different. But as you’ll see in this review, the scammer did a very lazy job! The Faith Diet (as the scammer wants us to believe) was created in March 2018. It’s ‘author’ Christopher White (aka Father White or Simon White) claims that he has discovered ’12 Biblical ingredients’ from the Dead Sea, Red Sea and Sea of Galilee, which, when taken ‘in a precise order’ will help you lose weight. He even attempts to exploit the ongoing, never-ending debate between atheists and Christians by proclaiming that atheist scientists have declared ‘an unholy war’ against the Bible. According to him, atheist scientists believe that if they don’t ‘censor’ the Bible and keep it away from American families, the ‘shocking’ weight loss secret it allegedly contains will ‘put 95% of physicians out of business’ and shut down the multi-billion dollar pharmaceutical industry ‘forever’. Talk about conspiracy! Ugh. That’s exactly what was claimed in 60 Day Fix. But I’m not going to bore you with his rubbish backstory. Let’s quickly go to the reasons why you should NOT buy The Faith Diet. Father White Does NOT Exist! 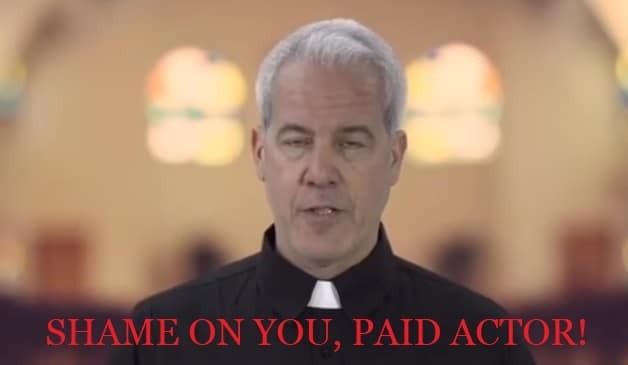 In the video presentation, you can see a man wearing a priest collar shirt calling himself Father White, a former ‘military chaplain’. Well I’m sorry, but that man is NOT a priest. He’s a paid actor! How do I know? Because I know for a fact that the original ‘author’ of this program was called ‘Jordan White’ (aka Father Jordan) and he was just a stolen photo of a Catholic priest called Bill Hill. Not only that, the photo he showed us of his wife and kids are fake. You can buy his ‘wife’s photo at iStock.com, and his ‘children’s photo has been everywhere on the internet since at least 2011. Besides, since we’ve already established that the woman in the photo is not his wife, what are the odds that those kids are indeed his kids? Zero. So don’t listen to that shameless man who’s only interested in the paycheck he’ll receive for reading a script. The testimonials on The Faith Diet are not just fake, but are the same testimonials used in 60 Day Fix. You can see in my 60 Day Fix review that I exposed all of them and so I’ll just copy and paste my findings here for your convenience. ‘Fred’ from Utah is actually the stolen photo of a blogger named Robbie. This just proves how incredibly lazy this scammer is. In fact, I’m done with this review. If you want more information about this product, my 60 Day Fix review‘s got you covered. Final Conclusion: DON’T BUY The Faith Diet. It is A SCAM! As you can see, The Faith Diet is not just an offensive weight loss program that insults the intelligence of Christians, but is also a lazy rebranding job by a dumb scammer. Don’t hire this kind of person to handle your PR! Clickbank is the retailer of this program so if you made the mistake of buying it, simply contact Clickbank directly for your refund. Don’t bother going to ‘Father White’ because you’ll never get your money from him. Trim Down Club. This is the cheapest weight loss program in my Whitelist. Starting at just $1.99, you’ll get access to hundreds of recipes designed by a group of certified dietitians and nutritionists. You even get to plan your own menu with your favorite foods! Check out my review first before joining! The Half Day Diet. Suitable for everyone, this program shows you how to lose weight by dieting in the day and eating all the carbs you want at night. Read this review for more details. Organic Total Body Reboot. One of the first entries to my Whitelist, this weight loss program by celebrity trainer Thomas DeLauer is for those whose weight issues is caused by chronic inflammation. Read my review for more details before buying. Eat Stop Eat. This innovative program by nutrition expert Brad Pilon has stood the test of time. It shows you how to properly implement fasting for weight loss while eating anything you want on non-fasting days. Check out my review for more details. All these programs issue timely refunds so you don’t have to worry about not getting your money back if not satisfied with the product. So feel free to check them out. The comments section is open for anyone who has a contribution to make. Thank you! You’ve offered no proof that the diet doesn’t actually work.